Pete Smith - Hailing from South-West of Chicago, Pete is a high-energy, progressive banjoist specializing in the three-finger or Scruggs style. 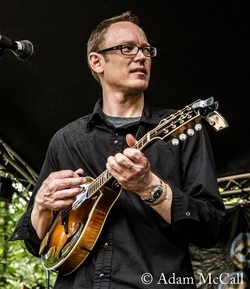 Pete began honing his banjo craft in 2001 while studying under the great Greg Cahill at Chicago’s acclaimed Old Town School of Folk Music and has strived to take the banjo to new heights ever since. Pete has played all over Chicago and south with such acts as The Henhouse Prowlers, Leadfoot and Bawn In The Mash. In 2010 he teamed up with Michael Petterson and Jim Cox (to name a few) to perform A Bluegrass Mass at the Pick-Staiger Hall and The Mac Theater as part of The New Classic Singers concert series. Pete has shared the stage with such acts as The Emmitt- Nershi Band, Head For The Hills, and Tony Furtado to name a few. In 2011, he teamed up with Chicago bluegrass troubadour Ben Benedict to form DOG 1 and is still performing today. He continues to push the five-string banjo into new genres while staying true to his bluegrass roots. Andy Miller - Andy Miller was born in Ventura, California several decades ago and has been migrating east at a very gradual rate. Early on in this migration, he stopped in Wyoming for a while where his parents encouraged him to play some music with them and their picker friends. Thus it began, starting with the mandolin and adding other instruments as opportunities arose. Although he’s mostly self-taught, he spent a few years studying music at the University of Wyoming, picking up a good amount of useful guitar and theory and ear-training there. His musical background includes marching bands, concert bands, jazz bands, rock bands, blues bands, bluegrass bands, and solo work. He now resides in Chicago with a little black dog who likes to sing along. Ben Benedict - Born and raised in northeast Missouri, Ben spent most of his childhood playing music in family jam sessions. With a wide variety of musical interests, he would drive around the old gravel roads and listen to anything the radio would throw at him or any of the number of Flatt & Scruggs, Bill Monroe, Mark O’Conner and Tony Rice albums he kept wearing out. Completely self-taught, Ben spent many hours breaking down solos and learning riffs on songs from Monroe to Zeppelin and all points in between. In college he delved into music theory and brief forays into jazz, while continuing to play the traditional music he was raised on. After college Ben moved to Chicago where he has performed at most of the venues large and small including Park West, Fitzgerald’s Night Club, the Noble Fool Comedy Club Cabaret, Schuba’s… the list goes on. He has toured all over the country and can often be found on stages or picking near a campfire at any number of festivals throughout the year – as his favorite place in the world is at a festival sharing music with friends. Emma Dayhuff - Emma Dayhuff, acoustic and electric bassist, is a graduate of the Oberlin Conservatory’s Jazz Studies program, where she studied privately with Peter Dominguez, Eddie Gomez, and Thomas Sperl. She has also enjoyed additional close instruction from such jazz luminaries as Billy Hart, Robin Eubanks, Larry Gray, and Wendell Logan.Emma has played in Symphony Orchestras in Carnegie Hall and Walt Disney Concert Hall, and has shared the stage with Jeni Fleming, Craig Hall, MJ Williams, Brad Edwards, Claire Daly, Roseanna Vitro, Chicago’s Bach and Beethoven Ensemble, Fuzzz, Groundspeed, and Vaughn Wiester’s Famous Jazz Orchestra. In addition to maintaining a performing schedule, Emma is a recording engineer in the Chicago area. She has worked at WFMT on the radio program “Exploring Music with Bill McGlaughlin”, and has worked two seasons in the recording studio of Vermont’s Marlboro Music Festival. She is currently the assistant recording engineer for the Chicago Symphony Orchestra, Lyric Opera, and Grant Park Music Festival. Andy Ohlrich - Andy plays the fiddle/violin, viola, and mandolin. His roots are deeply classically bred as evidenced by his role as Concertmaster of the Purdue University Symphony Orchestra, but he started venturing out at an early age, playing the fiddle in bands that covered genres from bluegrass to hard rock and most everything in between. He has traveled the globe with his fiddle and has had the privilege of creating music with harmonica great Lee Oskar of War, Chuck Garvey of moe., Future Man of Bela Fleck & The Flecktones, acclaimed classical vocalist Daniel Rodriguez, and many others. While highly revering his violin/fiddle heroes Mark O’Connor, Stephane Grappelli, and Jean Luc Ponty, Andy draws much of his style from guitarists such as Trey Anastasio, David Gilmour, and Stevie Ray Vaughan. Feeding off the energy of the band and the energy reciprocated by the fans, he delivers an intense aural outpouring of improvised melodies night after night. Andy would like to sincerely thank all that have taught, guided, and influenced him on his musical journey, most notably Marianela McCammon, Tammy Ringas, Jonathan Leight, Brian Breed, Jay Gephart, Kevin Purcell, Hello Dave, his beautiful wife Carley, Uncle Mike, and of course, Mom & Dad.